I’m super excited about this post cause I have wanted to try and make my own pizza for a while now. I even trained on the pizza station at my job on Newbury Street (the same place that inspired one of my pizzas in this recipe). I heard from a good friend that I could find pizza dough at a local Whole Foods, so I was ready to do this without having to worry about making my own dough (baby steps, guys). So I had a friend over (who is a veggie so I made one pizza meat–free for my other veggies out there), popped a bottle of wine, watched some Game of Thrones (naturally), and tried to make some pizza. Okay so while you can obviously put anything you want on top of pizza dough (and I certainly don’t want to be the person to limit your creativity) I’m including two of my suggestions that I found and tried, and loved. I started out by thinly slicing the onion and caramelizing over medium heat with butter and balsamic vinegar for about 10 minutes or until soft. I kept the onions going while I rolled out the dough on a floured surface until my desired thinness. 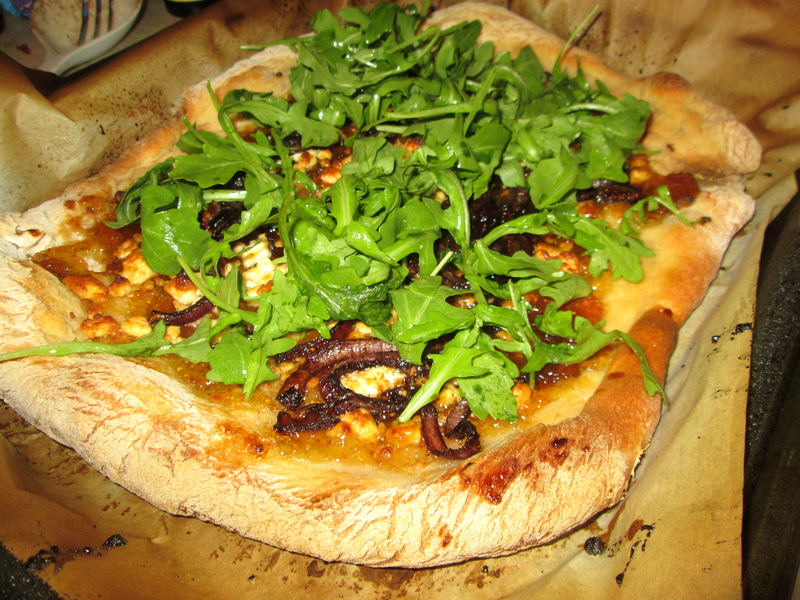 For the fig pizza, I spread the fig jam on the dough and sprinkled generously with the goat cheese and balsamic onions and put in the oven for about 12 or 15 minutes. When the pizza has come out of the oven and cooled a bit, I mixed some of the arugula with olive oil and lemon juice and placed it on top of the pizza. Serve. 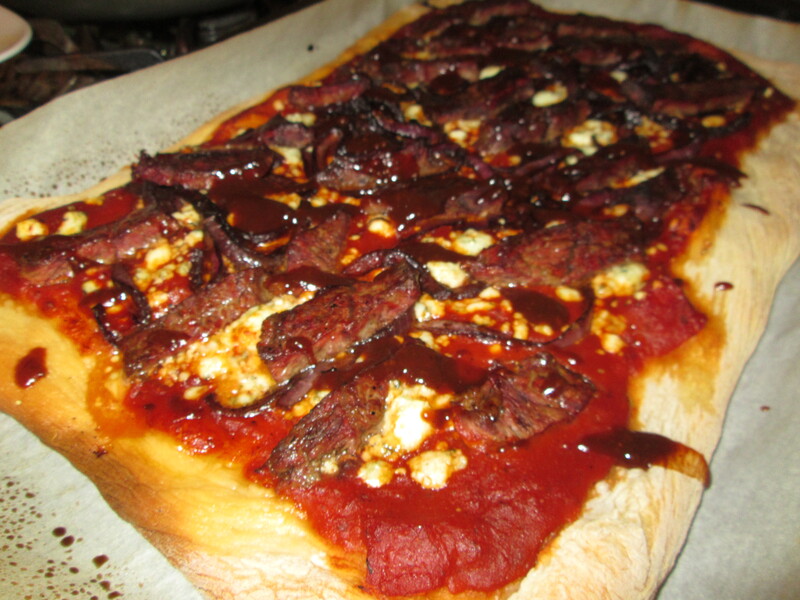 For the Steakhouse pizza, I mixed some steak sauce and Worcestershire sauce with the jarred marinara and spread it on the dough. I topped with blue cheese, the balsamic onions, and steak that had been cooked to rare and sliced thin. 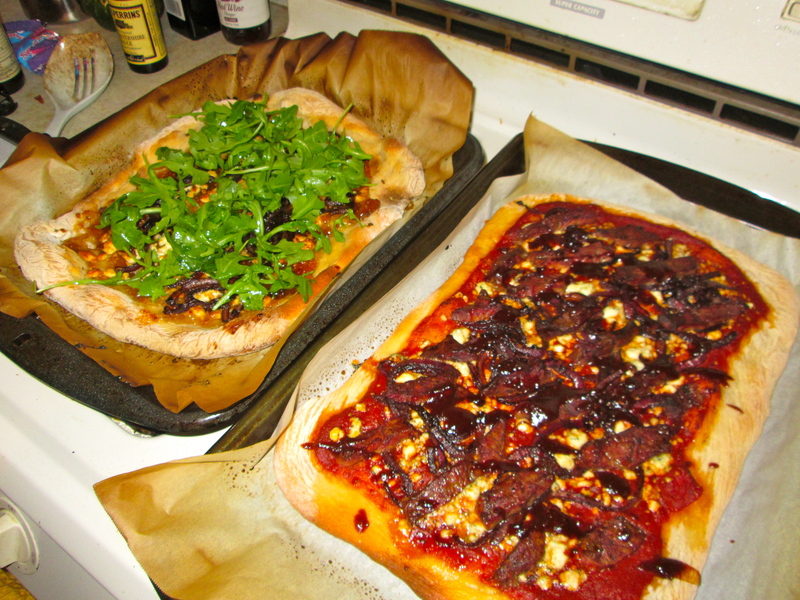 Place in the oven for around the same time as the fig pizza, or to dough’s desired doneness. Top with more steak sauce and serve. A simple, yummy dinner. Happy Halloween everyone!